Don't worry I don't, was just playing on that rep for my post. I am just aiming to please the board! Despite the trophies, they are only satisfied at the moment! How can they sit there and go "Becks, that was a satisfactory season"
manure stopped your clean sweep. It's puzzling. According to the confidence scale, they were happier with the community shield win than the champions league! Up there together with my first club! 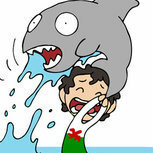 Going really well so far, have you thought much about your next move at all? The ultimate aim is to win the World Cup with England but the current manager doesn't look like he's leaving anytime soon Need a club to nurture English talent and Arsenal is the perfect place to do it at the moment! 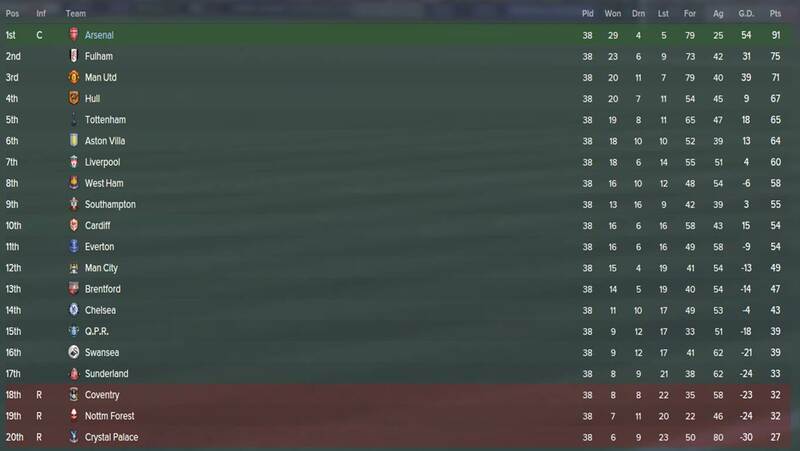 Pre-season 2033/34 - Arsenal F.C. My board are a hard bunch to please. We won it all except the Premier League last season and they were only satisfied with our six trophies. This season, in short, we have to at least wrestle back our premier league title and win the FA Cup to keep them happy. 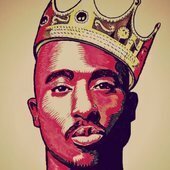 But still, being the rebellious me, youth development comes first! Just that one player in as I want to keep faith with the players who almost won it all last season. Our experienced Uruguayan striker was sold and Gavin was brought in to provide some much needed striking options. The 20-year-old is one of the most determined young footballers in world football and with clubs like Chelsea sniffing around, it made our decision to sign him very easy. 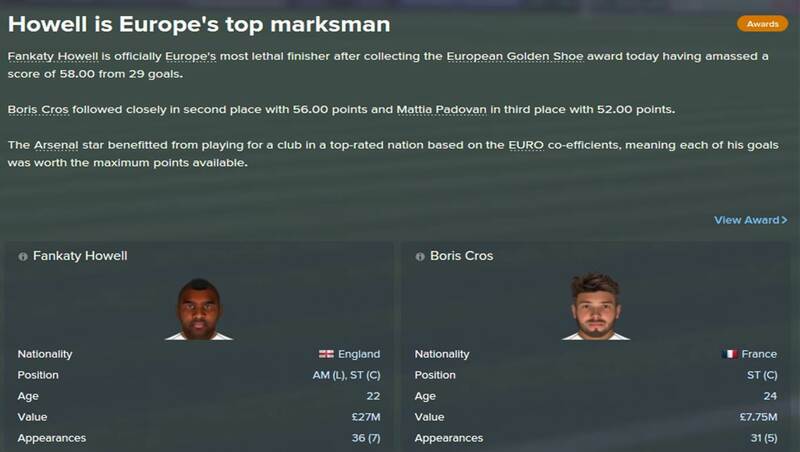 I will give him time to settle this campaign and when next season comes, it will be his time to shine. Good to see Fulham up there too. 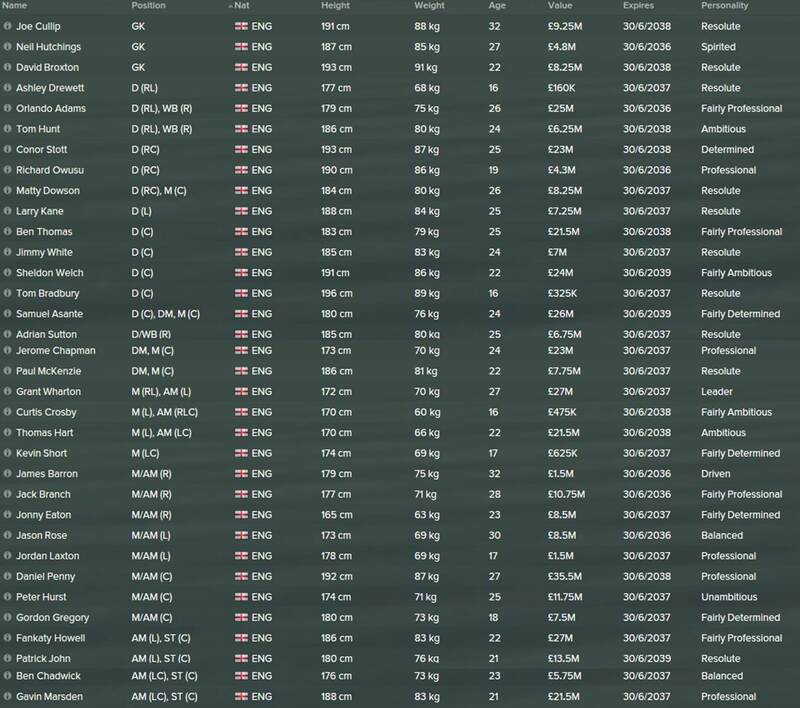 Looks like all the youth stuff is going well, despite an ambitious board. 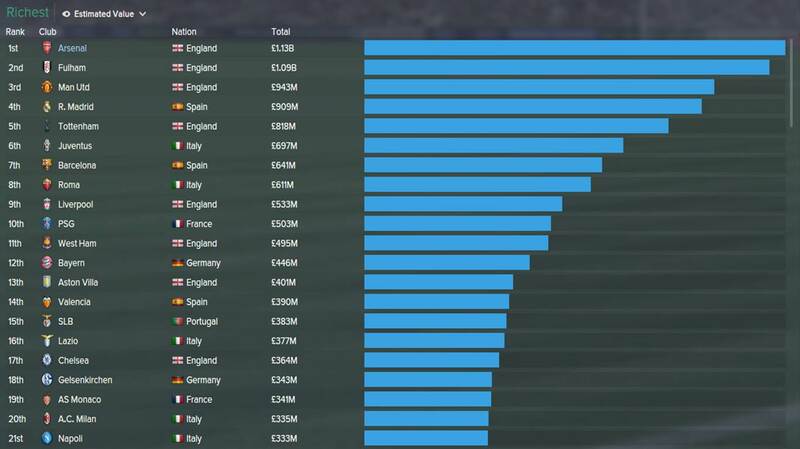 How have Fulham become so rich? Watching the young players grow is the main thing now! 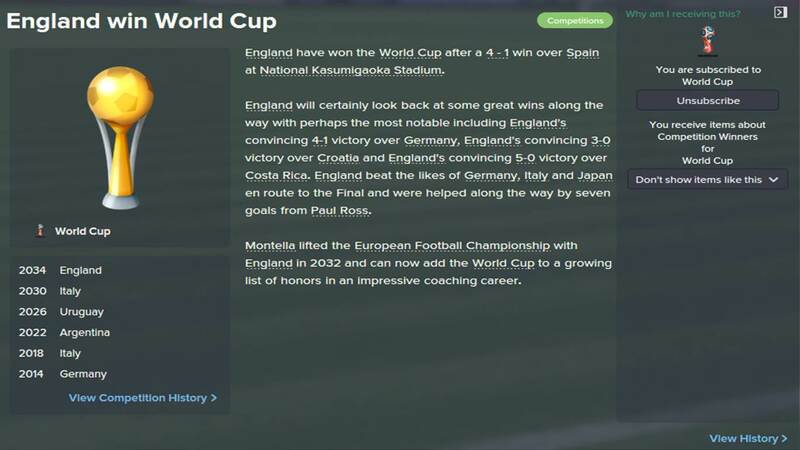 Montella needs to quit England soon!! Cracking save, any plans to vacate the Arsenal job in the near future? That's great. It's all working the way you wanted it to work. 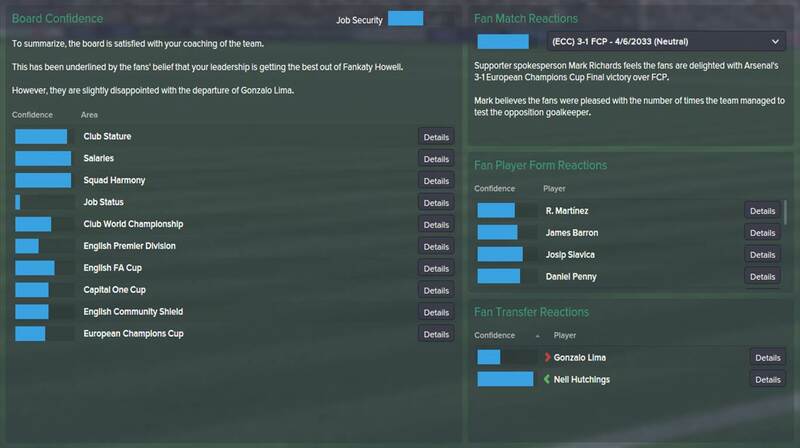 Not at the moment as I have a good system in place to prepare the English players for England while I wait for the England job to come around! Cheers mate! Hopefully the numbers can go up in the next few years! 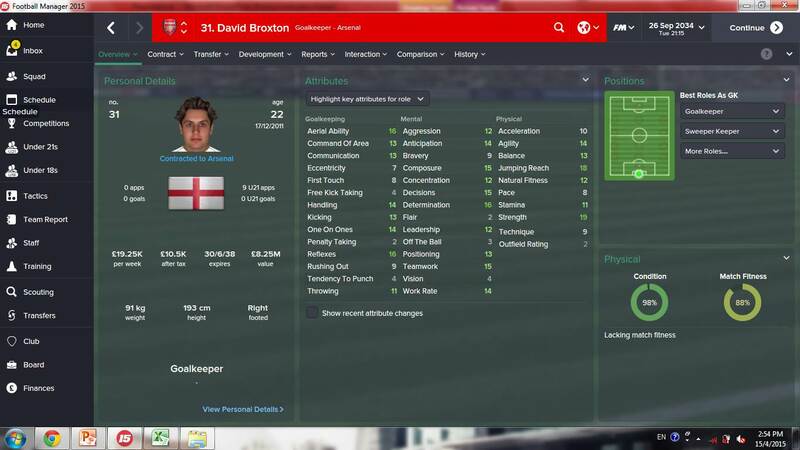 Despite not having the greatest stats or the greatest name, the young English striker is one of the best goal scorers I have managed on FM15. It is only end Feb and I can't wait to see how many goals he will end up with! Great comeback and Howell looks great will be interesting to see how he develops. Thanks mate! 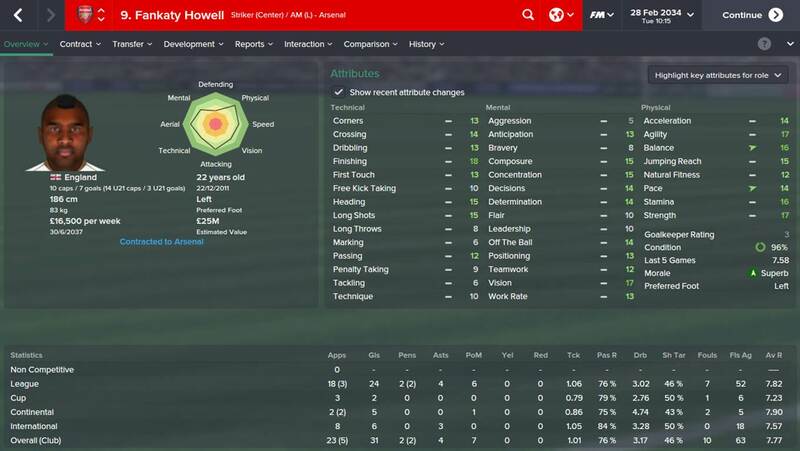 Howell has proved that you don't need great technique to score goals! He only has 10 for technique! Excellent report, Greetings from sweden. I am using the default dark skin and was using the Steklo skin which is downloadable from the steam workshop! Cheers mate! But why do you hate them so much? Just had an unbelievable 1st leg result against my former club at the magical Emirates Stadium and a quick check on the Bundesliga table left me in shock..
..how can they be 11th?! 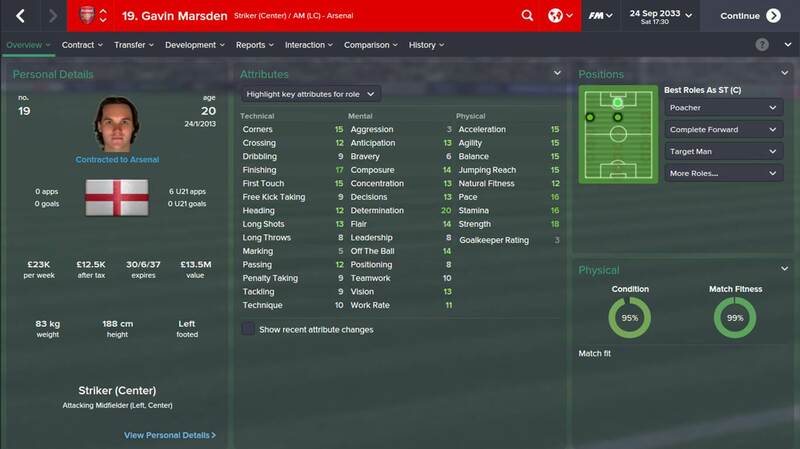 Unbelievable, they have such a great youth system with so many good young players when I left! 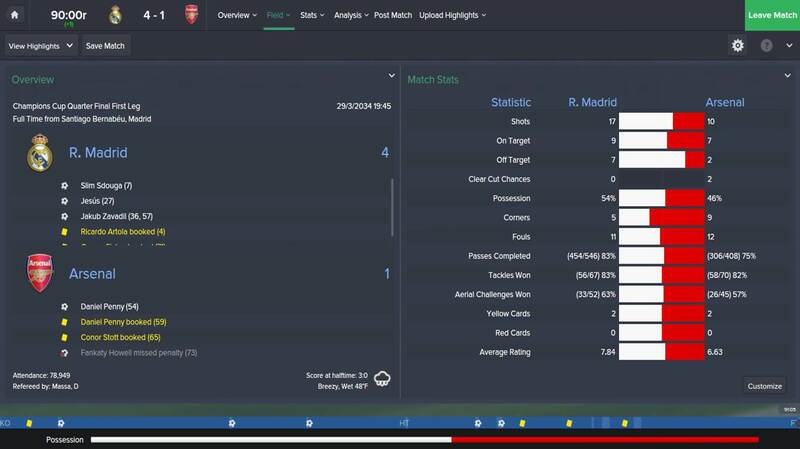 Season Review 2033/34 - Arsenal F.C. I was glad to see our boys wrestle back the trophy from Man United and it was also pleasing to see my first club up there in second spot. 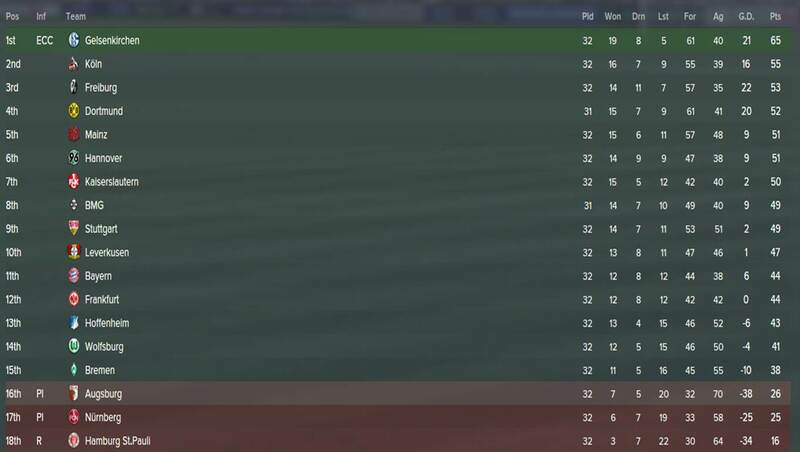 Eventually, we won the league by 16 points, scoring 79 and conceding 25 in another defensively solid season. We were lucky in the draws all the way till the final and the boys lived up to their expectations by lifting the trophy after a convincing 5-2 victory in the final against Brighton. We were all disappointed after a narrow loss in the semi-finals against our rivals Man United. We had more shots and arguably the better chances but Man United pounced from a set-piece to stop us from retaining the trophy. Biggest disappointment of the season after coming so close to retaining the trophy. The lads probably peaked at the wrong time after impressive victories against Real Madrid and Bayern Munich in the quarters and semi-finals respectively. Eventually, we came unstuck when we conceded three poor goals via a combination of poor defending and moments of brilliance from the Barcelona players. Well-deserved awards by our player of the season and Fankaty finished the season with an impressive 29 league goals and 7 assists in only 33 league appearances. My 'European' team has always been Barcelona, going back to the 90's, and in fact there is also a strong ancestral family connection (to the point where I count Catalan as one of my 4 'nationalities') along with Madrid's fascist connections, focus on marketable stars over a sensible transfer and selection policy, an arrogant knowledge that they can sign even the likes of Ronaldo and the past galacticos and no other club in the world can resist (though I do hold my hands up over the way the Fabregas signing was handled), and being awarded 'Team of the Century' by FIFA had a strong 'teacher's pet' feel as well and seemed to be just another way to 'honour' them as it's not an obvious award to have otherwise. 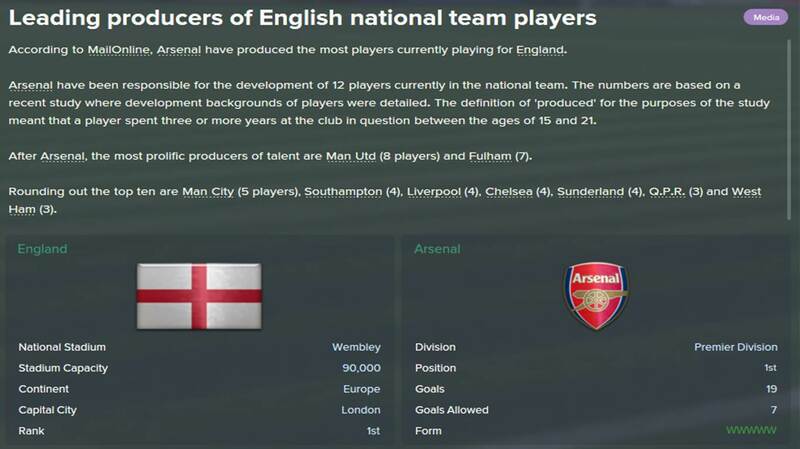 Another good season, looks like the England job is sewn up though. Are you still using your 4-1-4-1? Been experimenting with one myself - if so. what role do you give your CF? Thanks mate. Montella should totally go for the Italy job instead, they kept offering me the job! I use 4141 for most of my away games/tough cup ties and turn to 442 at home/against teams which park the bus. False Nine works best for me in the 4141! 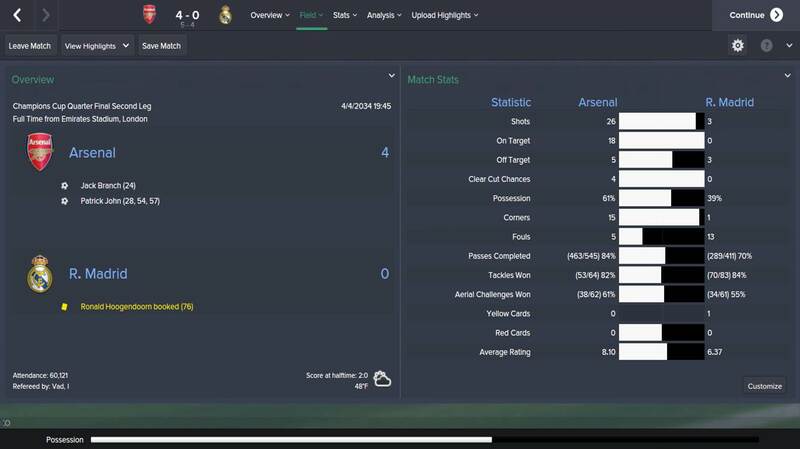 Pre-season 2034/35 - Arsenal F.C. For once, the board did not raise their expectations and they were identical to last year's. The young English striker was on loan at the Emirates Stadium two years ago and this time round, he joins permanently and will be our fourth choice striker in the upcoming season. We needed more pace down our right flank and Jonny offers exactly that. The quick winger is a different option from all the other wide players at the club and he will get lots of game time in London. Samuel has been on our shortlist for quite some time and we finally need him after we let our ageing anchor go. The tough tackler will compete hard for the first-choice midfield anchor role. David is signed as our future no. 1 and he will take his time to further his development at the perfect club. Tom replaces the last non English player in our squad and..
..we have finally achieved an all English squad! Probably the team I least expected to have a full english squad, good work and hopefully brings some more success. 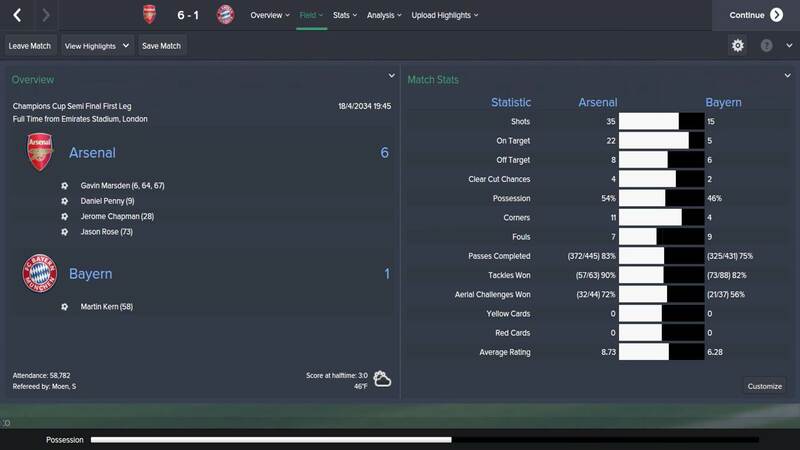 Almost a complete opposite to the real life Arsenal.